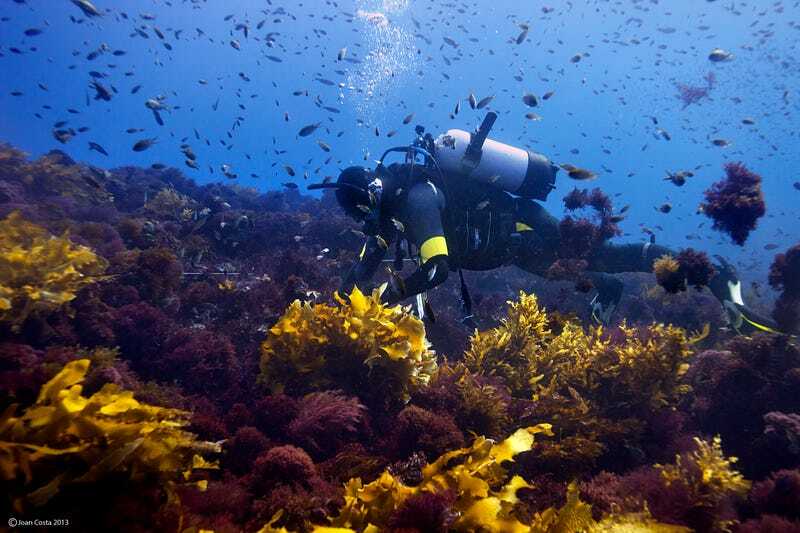 One of the largest kelp forests on Earth is dying because of climate change. Australia’s Great Southern Reef has lost 100 kilometres of coastline to a series of extreme heatwaves from 2011 to 2013, according to research published this week in Science—and the problem is getting worse. You probably haven’t heard of the Great Southern Reef, which receives far less media attention than its ill-fated neighbour to the north, the Great Barrier Reef. But the Great Southern Reef is an equally important ecosystem for humans and marine life alike. Fringing some 71,000 square km (27,000 square miles) of Australia’s rocky southern coastline, this “biological powerhouse” harbours thousands of species of fish, crustaceans, mollusks and other marine invertebrates found nowhere else on Earth. It also contributes £7.7 billion to Australia’s annual economy through fishing and tourism. “We then started a broader investigation of impacts across the coast,” Wernberg told Gizmodo in an email. Over the next few years, La Niña kept temperatures high as Wernberg and his colleagues conducted a detailed ecological survey of the Great Southern Reef. Overall, the two year heat wave triggered kelp forest die-backs across 2,300 square kilometres of reef and “functional extinction” along the northernmost 100 kilometres. Rather than recovering after the ocean cooled off, this dead kelp forest was replaced with seaweed mats and an odd assortment of invasive subtropical species. It’s the most rapid and catastrophic kelp forest die-off ever seen anywhere on Earth. Kelp forests are a bastion of marine biodiversity, blanketing roughly a quarter of our planet’s coastlines at temperate and polar latitudes. While poorly-studied compared with coral reefs, what scientists do know suggests these ecosystems are highly temperature sensitive, meaning they’re likely to suffer more die-backs as the oceans continue absorbing heat from our carbon-loaded atmosphere. According to Wernberg, marine biologists are now witnessing similar signs of heat stress off the coast of Japan, and possibly Tasmania. “But more broadly, there are many signs that similar effects will manifest in many places in the near future,” he said. As for the Great Southern Reef, ecologists are going to be watching it closely in the months ahead, particularly if La Niña returns as predicted.